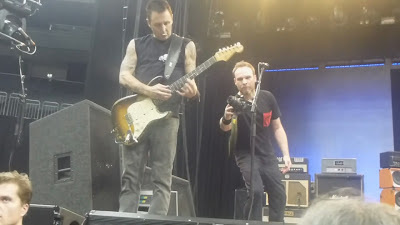 Second night in Berlin was the show about Mike McCready. He played a part of 'Eruption' solo before "Sad", and then he closed the show with a sort of 'Eruption' based "Yellow Ledbetter" solo. 'This is Miky Van Halen, mmm... Mike McCready right there!' - introduced him Ed. Another highlight was unexpected jam, when prior to "Corduroy" Ed faced some technical problems with his equipment. Other band members after short conversation played improvisational jam with some nice Mike's solo work. Never happened such an amazing live thing since many years, maybe since 90's when Pearl Jam often played live improv compositions. This jam was good, not short, and very smooth, so it could be considered as a piece of their rehearsal work for the new album. Why not? Ed voice was getting better and better with each night, and Berlin-2 was not bad at all. Audience was very hot, restlessly crowd-surfing, so Ed two times for one show had to urge people in the pit to make steps back. This is an audience video, youtube based (HD only sources), multi-camera edited (with Vegas Pro 11 as 720p), sound-board audio, 3 songs missing, picture quality is average for couple of songs, good for the rest. Video is available as 720p HD, 480p and DVD-DL 480p. Best quality option is HD.